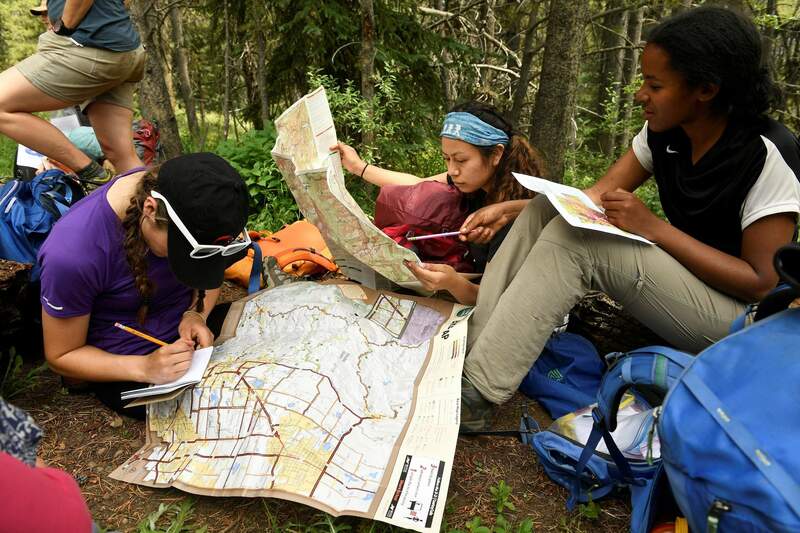 Molly Hancock, left, Yareli Herrera, middle and Taliyah Emory-Muhammad, right, learn how to read a paper map with other girls along the Gore Range Trail near Frisco. The girls, from all over the nation, are taking part in a new program called Girls on Rock which is part of an Alaska based organization called Inspiring Girls Expeditions. The program provides a unique, free, wilderness science education for high school girls. DENVER – The leg-busting path shot straight up, encountering small aspens before veering hard right at the base of a sheer rock. The conversations of teenage girls broke through the foliage, covering the soft rumble of cars passing below on Interstate 70 just near Frisco. Nine girls – and five female instructors – were gathered around four ropes. 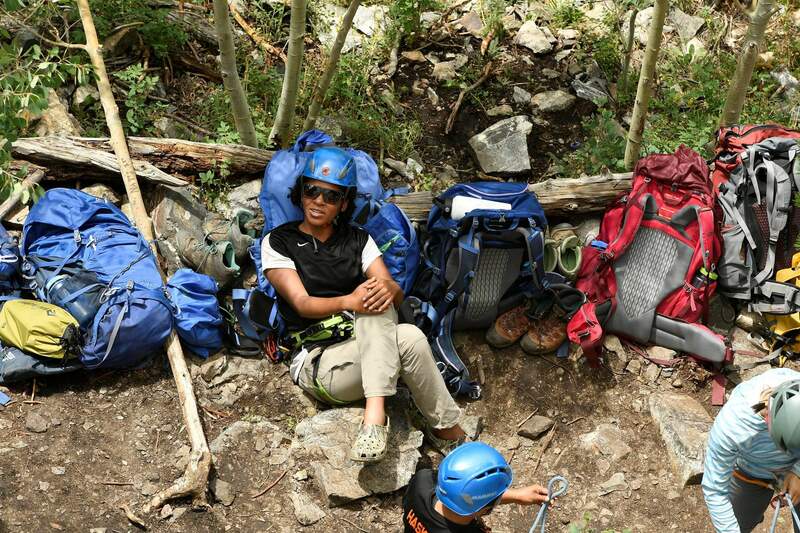 It was Monday, July 23, one of the first days of Girls on Rock, a free 12-day education program designed to encourage women and people of color to get into field sciences and teach them wilderness skills. It’s part of Inspiring Girls Expeditions, a program based in Alaska. After climbing, the girls took a hike and stopped for a lesson on how to interpret maps and figure their location using nothing but string and their current elevation. “I feel like Dora the Explorer with her map and her backpack,” Aiyana Austin joked. With Copper Ski area in the background, onsite coordinator and instructor Mylene Jacquemart, right, leads a group of girls from Girls on Rock along the Gore Range Trail near Frisco. Nine young girls from all over the nation are taking part in the new program which is part of an Alaska based organization called Inspiring Girls Expeditions. The program provides a unique, free, wilderness science education for high school girls. This first program has been years in the making. It just wrapped up earlier this month. But if the financial situation stays as it is now, Girls on Rock’s future is on shaky ground. The teens said there were a variety of reasons they wanted to participate in the program: Meet new people, engage in science during the summer break and conquer fears. They were shocked by how quickly they became friends as they learned how to trust themselves and others. The girls were all smart and inclined toward science. They applied to participate – applicants write essays but the program doesn’t look at their grades. Instead of girls needing to meet certain criteria, instructors looked for those who would join to create the strongest team. There’s Miauaxochitl “Mia” Haskie, 16, from New Mexico, who is aiming to get into MIT. There’s fellow New Mexican Aiyana Austin, also 16, who took AP musical theory just so she could be at the top of her class. Taliyah Emory-Muhammad of Maryland, relaxes on her backpack as she watches other girls climb at White Cliff in Frisco. Emory-Muhammad and eight other young girls from all over the nation are taking part in a new program called Girls on Rock which is part of an Alaska based organization called Inspiring Girls Expeditions. 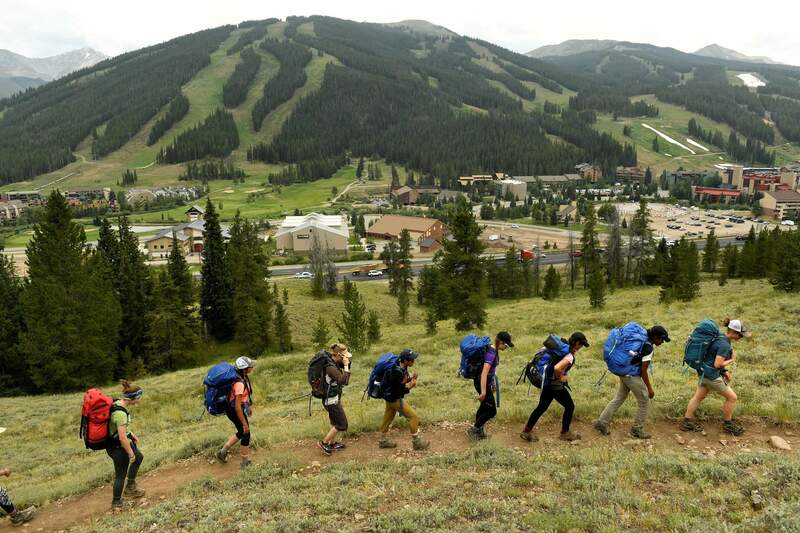 The program provides a unique, free, wilderness science education for high school girls. There were teens from large cities, like Denver’s Guadalupe “Lupita” Ramirez, and others from small towns, such as 16-year-old Chloe Crocker from Fredericksburg, Texas, who said the only fun thing to do in the tourist town is go to the bowling alley or movie theater – and the bowling alley is about to close. 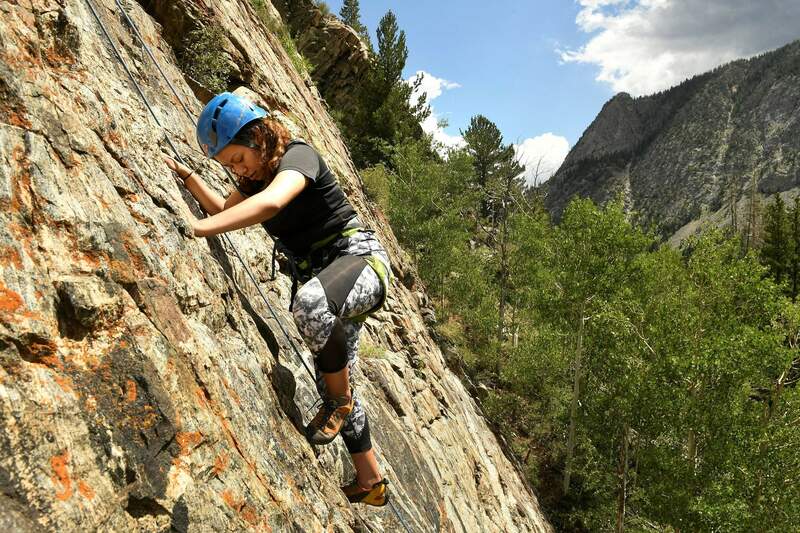 Some were experienced with the outdoors, such as 17-year-old Taliyah Emory-Muhammad from Maryland, who climbs as a sport during the school year. But there were also girls like 18-year-old Jessi Figard, from North Carolina, who said she’s never hiked before. Her mother has a physical disability called Ehlers Danlos Syndrome – which Jessi shares – that prevents her from going on camping trips. Evelyn Cheng, an ecologist, and Megan Blanchard, a chemical ecologist, have been working to create the program since 2014. At the time, Cheng was finishing a master’s degree at the University of Colorado Boulder while Blanchard was – and still is – pursuing a doctorate. Yareli Herrera makes her way to the top of a rock climb at White Cliff in Frisco. Herrera and eight other young girls from all over the nation are taking part in a new program called Girls on Rock which is part of an Alaska based organization called Inspiring Girls Expeditions. The program provides a unique, free, wilderness science education for high school girls. After crowdsourcing, grant writing and extensive collaboration with companies to wrangle free gear, the program finally came together with a $17,500 Force of Nature grant from REI. The program is run out of CU Boulder. But the funding process was too extensive for the Girls on Rock instructors – Blanchard, Cheng and three others – to keep up. The instructors who were also working on Ph.D.’s lost too much time. Additionally, Cheng had to take months off of work to finalize the program. But they want the program to continue in Colorado. So the group is looking for other funding sources, including a corporate sponsor. Blanchard said that she herself has been given many opportunities in life and wanted to share that with others. It went deeper for Cheng. As she talked about this program and why it mattered, she began to tear up. Both science and climbing are male-dominated fields that can cause female self-doubt, which Cheng says she’s still trying to work through at 36. “If I had something like this early on, I would’ve tried so many more things, questioned so much,” she said.